Perfect Effects is just one of several modules. You can apply ready-made presets or build your own effects with layers. 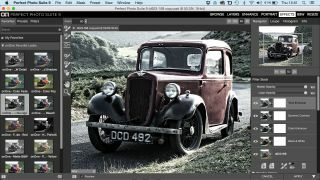 OnOne's Perfect Photo Suite is more than just a collection of plug-ins. The Browse module lets you view your whole photo collection with a folder tree and thumbnail previews, and version 9 adds the ability to apply ratings and keywords and filter your images. The Perfect Layers module is equally interesting, because if you use the suite as a plug-in for Aperture or Lightroom, it effectively adds layers capability to these programs without the need for Photoshop. You can combine images and use masks to control which areas are visible, and blend modes to control how they interact. Perfect Photo Suite 9 has a new Quick Mask Brush to help you make detailed selections quickly, and OnOne has reconfigured the masking options to make them simpler. Previously, Perfect Mask and Perfect Layers were separate modules with separate masking tools – now, Perfect Mask has been made part of Perfect Layers. There's now a noise reduction feature, too, in response to user requests, and a new lens flare filter. Perfect Photo Suite has evolved through many different versions to reach this point, but each one is a carefully thought-out improvement over the last. As a plug-in collection, it's probably not as well-known as the Google Nik Collection, but the Browse and Perfect Layer modules take it into areas that the Nik Collection doesn't cover. You probably could use it as your sole image-editing tool. OnOne has also rationalised the versions available, and Photo Suite 9 now comes in two versions rather than the previous three: Basic and Premium. The Basic versions costs $96/£60/AU$109 but only works as a standalone application. If you want to use the Perfect Photo Suite 9 modules as plug-ins for Elements, Photoshop, Lightroom and Aperture, you'll need the Premium Edition, which costs $168/£104/AU$190. Perfect Photo Suite 9 is now available as a 30-day trial from the OnOne website.